Vows From The Heart offers two types of Vow Renewal services devoted to couples wishing to celebrate their marriage! If you’re planning a celebration at a venue or home, we offer our couples a custom ceremony in for their Vow Renewal celebration. Whether it’s your 5 or 10 year celebration or your Silver or Golden Anniversary, adding a vow renewal brings all the magic and romance back to life in a ceremony that can be just the two of you OR one that can include family and friends in your celebration. 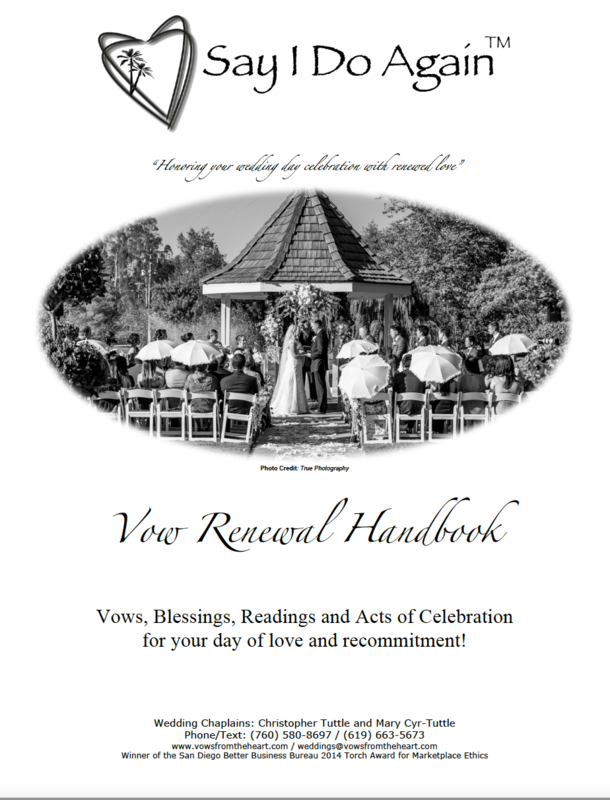 You’ll receive our “Vow Renewal Handbook” which will walk you through the the entire ceremony process and includes dozens of ideas with readings, vows, prayers, blessings and acts of celebration. Imagine the endless and loving possibilities you ceremony can be presented by a professional, award winning Celebrant in a Civil, Spiritual or Christian ceremony that reflects the two of you. Include your children, grandchildren and great-grandchildren! Invite lifelong friends to share stories of the years and experiences shared together. Or, if you’re looking for something smaller and more intimate…. Say I Do Again™ – Small and intimate seaside celebrations. 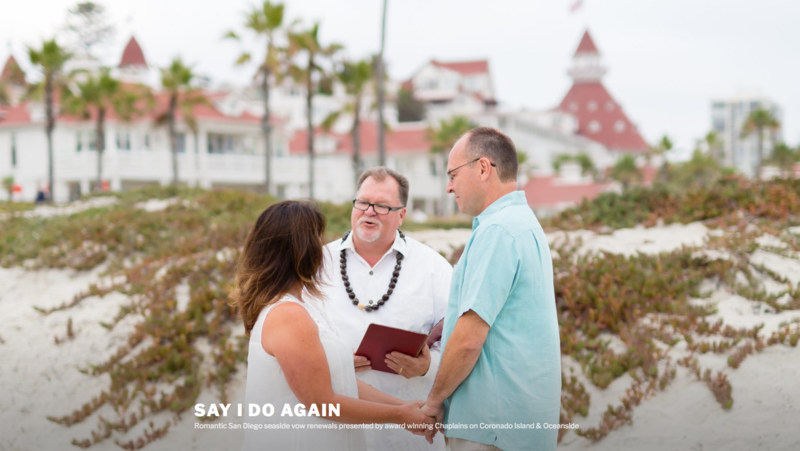 A private simple seaside Vow Renewal with up to 17 family and friends to witness nestled in the dunes of the historic and picturesque Hotel Del Coronado or, feet in the sand services in Oceanside.